When starting out as a new fantasy football team manager, you will be faced with decisions on what kind of league you wish to play in and with which scoring system. There are typically only three scoring systems to choose from, but each league or fantasy football site will have some variation as well as customizable options. The three primary scoring platforms are the standard, the PPR (points per reception) variation, and the IDP (individual defensive player) system. How often do you play fantasy football? How much time do you have to commit to research for your draft? Either way, trying all of the different scoring variations in free fantasy football leagues is highly recommended. 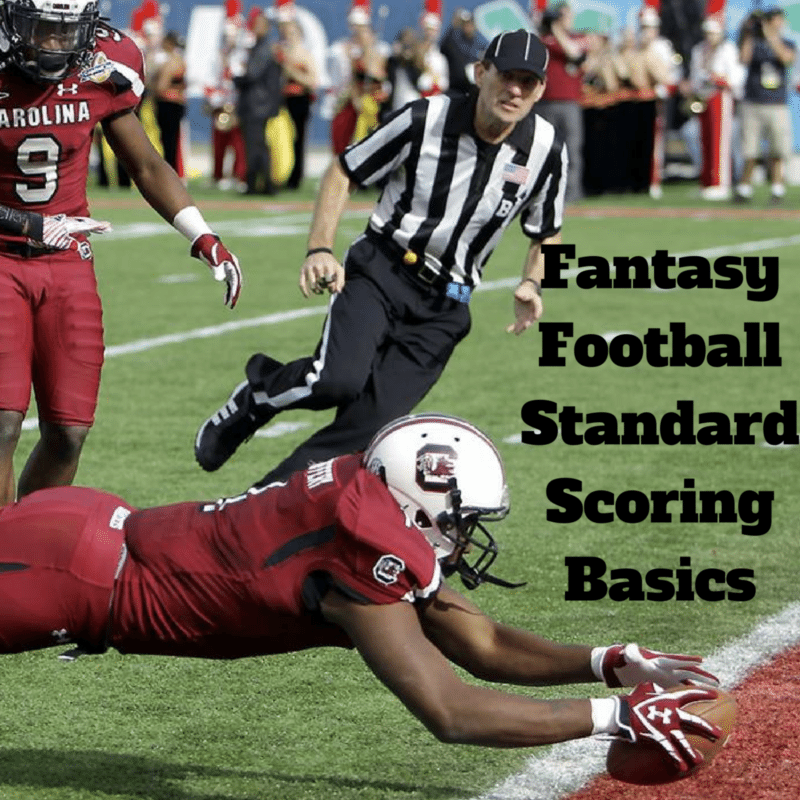 In this article, you will find the full explanation of the standard scoring system along with all of the possible options you may come across with this system in online Daily Fantasy Sports leagues. Be sure also to check out our strategy explanation on PPR and IDP variation scoring systems. The standard point system in fantasy football is the most popular and possibly the most simple platform for scoring. The overall score for your team is made up of all of the individual offensive player performances with an additional position for an entire defense. The point system will be very similar as you go from differing daily fantasy sports sites. However, some sites will give more points for certain game achievements, and you should understand all point scoring options before heading into your league’s draft. The overall purpose of the standard scoring system for fantasy football is to create balance between your draft choices, spreading value for all of the positions. The main bulk of your points will come from your offensive player selections, with a small portion of points coming from your kicker and team defense. In most standard scoring leagues, any play that results in a touchdown will give you 6 points for the player responsible. If you have both a quarterback and receiver who connect on a touchdown pass, the receiver, and quarterback both will receive 6 points each for it. In some standard leagues, and in many PPR variation leagues, the quarterback will only gain 4 points per touchdown. The two-point difference between leagues would alter the value of quarterbacks, as well as your entire team. That being said, it is smart to double check QB touchdown points before drafting. Other than that, a touchdown will always earn you 6 points. In some leagues, there is an option that only allows points to be received if the player scores a touchdown, these leagues are called, “touchdown only” leagues. In all standard scoring systems, you will find that quarterbacks receive 1 point per 25 yards of passing. These points are independent of touchdown points, meaning that on a pass that results in a touchdown, you would combine the total points gained for a quarterback. Passing points in fantasy are harder to achieve because quarterbacks can gain massive yardage on any given play; thus the rule balances the position with the others on the field. Any player that is considered an eligible receiver can gain receiving points in a standard scoring league. For every 10 receiving yards, the player wins one fantasy point. Receiving running backs, tight ends, and all receivers on the field are all capable of achieving receiving yards, meaning their position values are high when considering a strong draft class. Any yards gained after the catch would still be counted as receiving points. Similar to the scoring guidelines for receiving, rushing for 10 yards will earn your running back one point. In standard leagues, the running back is the most valuable position. This is because a healthy running back is hard to come by and you will need two in tandem to produce a favorable point total. Many strong workhorse backs will go first in the draft because of their ability to churn out rushing yards all game long. Receiving running backs are also valuable in standard scoring leagues but are preferred in PPR variation leagues. If your kicker hits a 40-yard field goal or shorter, in most leagues he will gain 3 points. However, in some leagues on Daily Fantasy Sports sites such as FanDuel, field goals that are made from further than 40 yards are eligible for more points. Typically, if the kick is good between 40 and 50 yards, 4 points are awarded. Between 50 and 60, 5 points. In most leagues, you will not be able to score more than 6 points for any given field goal, but there are rule variations that go by the fraction rule, awarding .1 points for every additional yard in the set (6.1 for a 61-yard field goal). Also commonly known as DST, Defense/Special Teams are comprised of one team’s entire defense and special teams group. All statistics that significantly help the team is valued using points. Typically, a defense/special team's position will start with 10 points and slowly lose those points if the offense scores. The 10 point start will drop 2 points for every 6 points allowed. For example if a team gives up 36 points, the defensive point total drops from 10 to -2. If you thoroughly enjoy defensive stats and players, take a look at our IDP or individual defensive player scoring system breakdown. Forcing a fumble will gain the defense one point, but if the defense recovers, then you get an additional one point for the recovery. On the other side of the ball, if your offensive player fumbles, they receive one negative points. Additionally another point is lost if the offense does not recover the fumble. All interceptions result in two points for the defense. Quarterbacks will lose two points for throwing an interception. Quarterbacks that throw several interceptions in a season will negate many positive plays made by the offense. It is best to avoid risk taking quarterbacks in the draft to limit negative points. If any defender on your D/ST position registers a sack on the opposing team's quarterback, the D/ST receives one point. Teams like the Denver Broncos who have Von Miller and Demarcus Ware setting the edge are a great D/ST position because of numerous sacks and interceptions every week. Every league will have multiple options for each segment of fantasy football. Although the scoring for standard leagues on daily fantasy sports sites has been covered in this article, it never hurts to double check the rules to clarify any regulations. Scoring rules are always displayed and can be found easily before entering a competition. It is smart always to have the rules down before your draft and even before you put in the research. With so many different daily fantasy sports sites hosting thousands of varying tournaments and competitions, you can select the rules that fit your lineups and research. Remember to check out the remaining parts to our Fantasy Football Basic Strategy. Have fun and good luck!